Wow, it's already the first summer Monday. Time came to summarize AcademyOcean’s improvements in May! Of course we follow new European Union data law known as General Data Protection Regulation (or GDPR)! We provided more transparency about the data we collect, use and share, as well as information of the choices you make in the AcademyOcean platform. 2. We improved user experience for Academy editors, making it even more convenient! And, believe us, it has never been so amazingly informative! 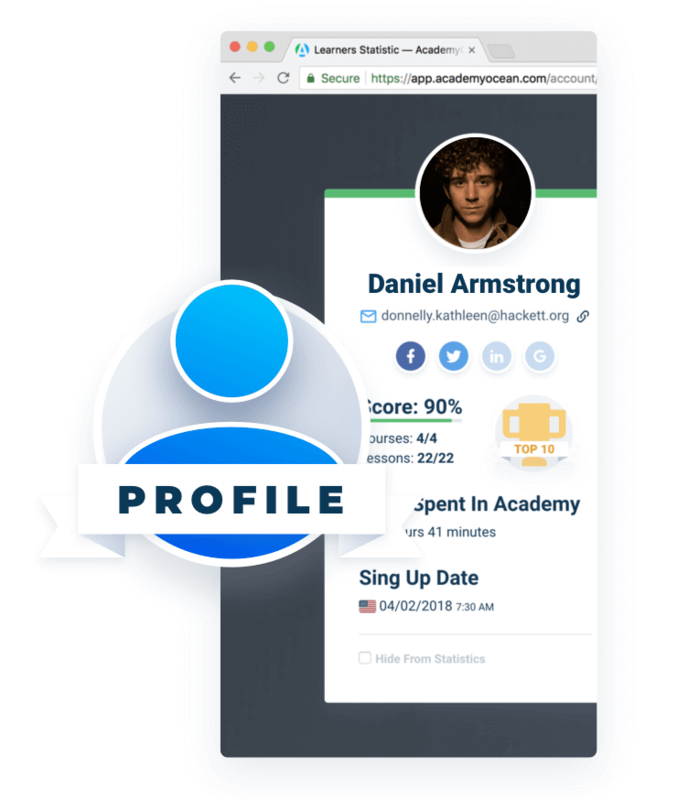 Now, all the valuable data on each learner is gathered in a single place - their personal profiles. Completed lessons and courses, quiz results, time spent in Academy - you can find it all on the Profile page. The more you know, the stronger and more personal your relationship with your user becomes. This is the way towards loyal customers and strong community around your product. 4. And one more bonus for learners! We added more settings so that they can easily customize their accounts. With new learner profile settings, your readers can quickly customize their account and connect their social network accounts (Facebook, LinkedIn, Twitter and Google+) just in one click. Also, we updated security settings according to the GDPR rules so your learners can easily manage their personal data in Academies. Meet the new feature in the content editor: you can zoom pictures in your content. By the way, this function is available in our blog too. 6. Nice news for Academy creators: content import became even easier. It is very handy to use it if you already have a base for your lessons on your blog, in a whitepaper or anywhere else. Just copy and paste it into editor, and your content is ready! The text formatting will be imported automatically (even images). 7. We cleaned up our mobile version and simplified navigation.